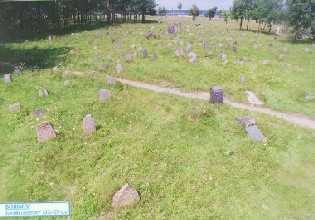 Below is a list of burials in Borisov’s Jewish Cemetery between 1944 and 1995. It was compiled by Boris Gitlin and presented on Alexander Rosenbloom’s Russian language website, Kokteil’ Moei Dushi (“Cocktail of My Soul.” There is more about this website here). Gravestones earlier than 1944 could not be identified because there was no Hebrew or Yiddish translator available to Gitlin and also because of Nazi mutilation of gravestones and cemetery destruction during the occupation. The Borisov Cemetery list was kindly transliterated for me from Rosenbloom’s Russian website by Leon Kull, using transliteration software. I then made a few transliteration adjustments and altered the alphabetization from Cyrillic. Please contact me about any errors you may find. As you search this list, please be aware of all possible spelling variants. There are a number of transliteration systems for the Cyrillic alphabet. Cyrillic letters which don’t occur in English are transliterated differently in different systems. The numbers at the far right of each name relate to the gravestone location in the cemetery. If you need more information about this, please contact me using the “Leave a Reply” or “Contact Anne” forms at the very bottom of this page. I have omitted a number of names listed as “Unknown,” with only some dates noted. This entry was posted on Thursday, October 14th, 2010 at 4:20 pm	and is filed under Alexander Rosenbloom's lists, Mysteries of my grandfather...., The World of Jews in Borisov/Barysaw. You can follow any responses to this entry through the RSS 2.0 feed. You can skip to the end and leave a response. Pinging is currently not allowed. You are very welcome. Thanks for being in touch. Thank you for posting information about Borisov. I plan to visit there in search of additional information about my family – Minkov. Who do you suggest that I contact? Thanks again. You can email him by clicking on his name on that page – an email form will open. If you speak Russian, you could contact Alexander Rosenbloom via his website: http://www.rpp.nm.ru/ Click on контакты at the top of the page and an email form will open. If you let me know how these work out, I’ll keep thinking about other people you might try to contact, in Belarus and outside it. I’m looking for my grandparents Vorobeychik Iosif Abramovich and Kravtsova Genia Iosifovna.They both were buried in Borisov Jewis Cementery. Please give me information about them because I can’t find them in the list of buried persons. Hello, Alex, I’m so sorry, I don’t have any information on your grandparents at this point. If I find it, I will try to let you know.